The past week or so, I've been spending just about five hours a day in the pool. Maybe not at once but several times in a day. There have been times though, where it was a solid four hours. Today, we were in it most of the afternoon, while it was raining. Quite nice. Let's see, where are we? Well, the guesthouse is almost completely painted - inside and out; we have the bathroom vanity, sink, and faucet installed, along with the tile back-splash; the toilet is in, although, it's plagued right now by a small leak that I'm trying to track down and solve; We had a couple of guys come by to measure, etc., for a bid for the kitchen cabinets and doors; and, we're supposed to get our louvers, sliding glass doors, and roll-up door installed tomorrow. That's about it. I've been busy, busy, busy. It seems when construction is underway, I make at least three trips to town for supplies, parts, you name it. Speaking of the toilet, we've replaced everything that came with it. The toilet seat cover had an unfortunate accident. We started with the seat. Dianna was actually responsible for this. As the installation was proceeding, she wanted to check to see how 'un-wobbly' the toilet was after fastening the flange bolts, so she sat on the lid. Instantly - boom! We weren't real happy with it in the first place, kinda cheesy. So, yesterday, I purchased a new filler valve and float. This morning, I got a new seat along with a new overflow/drain valve and new brass tank-to-bowl bolts and rubber washers. I also got a new connector hose as with the new filler valve, it naturally takes a different sized hose than the old one. Now, the toilet has completely new innards - and we haven't even used it yet. That's not true. I pee'd in it this afternoon, after caulking the gaskets to try to stem the leak. I flushed and bingo! It still leaks. Dangit! As far as the painting, all that's left is the bottom of each window louver, as the way they do it, is to install the louvers, then plaster up the bottom to fill in any remaining gaps. That's the part that still needs painting. And the roof - it still needs priming and an application of snow coat, almost like the stuff we would put on RV roofs. It's a rubberized product (quite expensive here) that once applied will lower the inside temp a concrete-roofed house by about ten degrees. We're also ready for the electrician to come back and complete the wiring, including installing another whole house surge suppressor and possibly moving the pool's waterfall and in-pool light switches to be more convenient - like inside the utility room of the guesthouse. Ow, ow, ow! That wasn't the brightest thing to do. After I got back, it's been bandages and immediately switching over to my sandals, that I haven't worn in over two years. (I haven't work the Keans in at least that, either). Good thing, cause we haven't been able to get over to Chetumal to Sam's Club to buy new Crocs. If it wasn't for the sandals and the Keans, I'd be barefoot. The doggies just would not understand me begging off from walkies simply because I had no shoes. After all, they go bare-footed every day and they don't complain. Speaking of walkies, each day, we walk past the local 'boatyard', actually just a part of Miami Beach, downtown. I had shown a picture of Paloma shortly after she arrived onto the hard. Now here she is sporting a very nice new paint job. I'm just waiting now for them to put her name back on her bows. She's a very pretty boat as is. Below, is another view of her from the stern. A lot of care and skill has gone into this paint job. And, speaking of painting, I know Vivien has been champing at the bit for some shots of the painting in progress. Here's a few glimpses. The color scheme inside is white, a very light blue (some folks think it's gray) and navy blue (azul de marina). And, a shot of the outside final colors, blue and terra cotta. Tomorrow, I'll be taking more photos as the louvers, etc., are installed. I'll be able to show more of the colors. I don't seem to have any shots of the navy blue. There will be. He took a lot of photos around the area, many while he was looking at property. Here's a link to his Picasa photo album: (http://picasaweb.google.com/pollymop). Enjoy. Well, that's about it for this evening. This is unusual. I normally do this about three or four in the morning. What happened? I'll take a bunch more and get something posted - soon. I promise! you Have been busy. The toilet seats in Belize are very flimsy. I decided to replace the one that came with the toilet in our cabana because it flexed considerably when used. So I brought down a $5US wood seat I got on sale at the local Menards store. I'm sure the Customs Agent at the airport thought I was crazy, not to mention my wife, but it worked. Since we are going to be putting in guest cabanas, I'll be bringing down more. Keep using that pool, we could have used one up here in Minnesota today. Hot, humid, and still. The place is coming along just great Dave! Glad to see that you two are getting some use out of that pool - you're going to wear it out at the rate you're going. Ha! 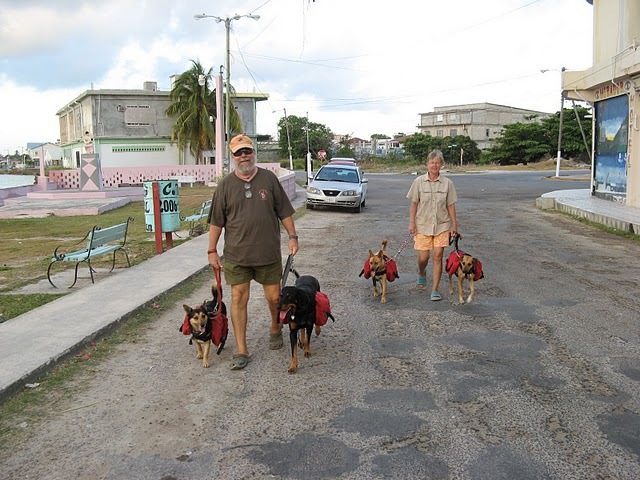 Glad you posted the picture I took of your 'walkies' as you always talk about them in your blog but a lot of people might have had difficulty picturing the dogs with packs! Looking good. Also maybe a lot of folks would like to see a few samples of what the local Corozal town R/E agents will show you if you tell them you're looking for 'investment' properties and they can get some idea with the link you gave to my albums. You're doing a very good job with your guesthouse! Thanks and greetings from Venice.